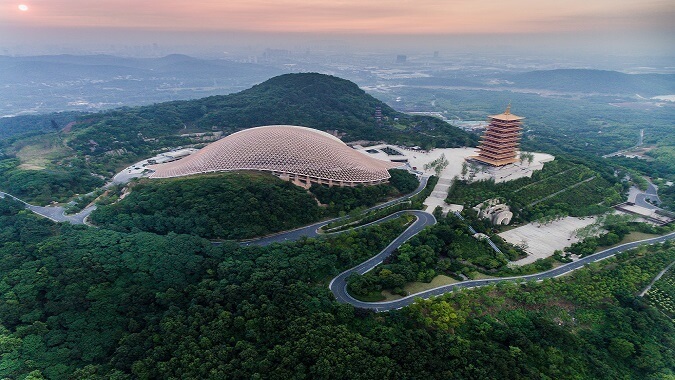 Niushou Mountain, named after the two peaks of the east and west of the mountain which are like horns on the Niushou, is located in Jiangning District, Nanjing City, Jiangsu Province. It is a famous Buddhist mountain in China. 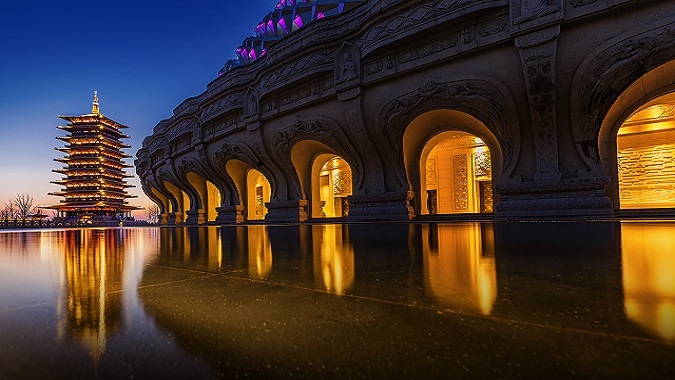 As the place of worship for the Buddha’s parietal bone relics, the whole Buddhist Top Palace takes the worship of Buddha’s parietal bone relics as the theme, and the outside is divided into two parts, the big dome and the small dome, implying external support and internal support. The large domes covers the small domes just like the cassock of the Buddha, symbolizing the unlimited blessing of the Buddha. The lower part of the small dome is shaped like a lotus throne, while the upper part is shaped like a mani stone ball, combining the upper and lower parts, the sacred image of “lotus supports treasure” is formed. When entering the Buddhist Top Palace, and going into the Buddist Mood Grand Temple, you begin to feel the the trace of Buddhist thoughts. It was not until you enter the Buddist Relics Grand Palace that you are completely shocked. 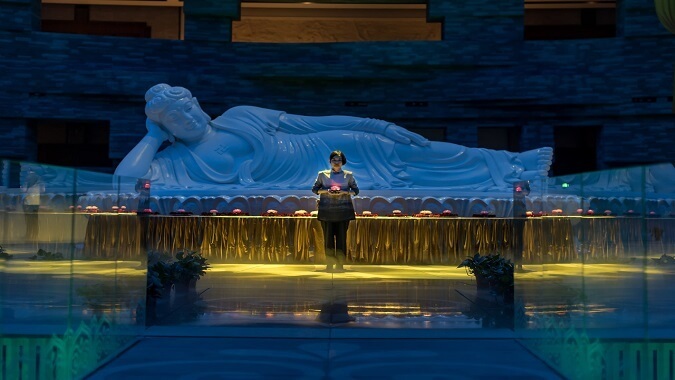 When you enter the Buddist Mood Grand Temple, you will know that Buddhism is profound. From the Buddist Garden where Buddha was born, the Buddist Garden where Buddha obtained the Buddha-hood and the Lotus Theater in the middle, the story of Buddha’s life is presented. Following the path of Buddha’s spiritual practice, can we realize the miracle of Sakyamuni turning from person to Buddha. From the Buddist Mood Grand Temple, take the elevator to the Thousand Buddha Hall. The Thousand Buddha Hall is mainly colored with red, yellow and dark gold. 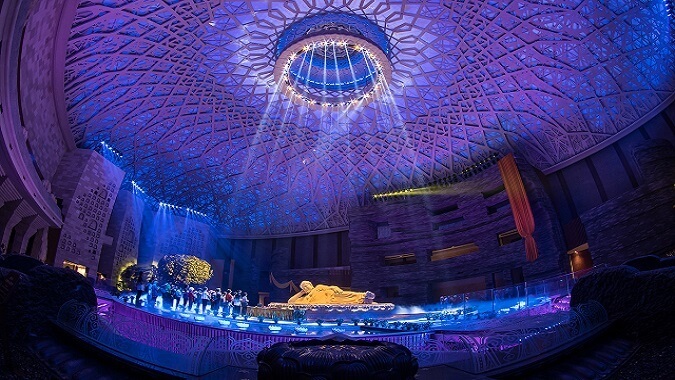 The space of the Thousand Buddha Hall is in the shape of cove and the plane is oval. Outside the Thousand Buddha Hall, there are Ten Thousand Buddha Corridor which covers three floors underground. Entering the Thousand Buddha Hall, seeing the solemn and lofty figures of Buddha that take across all the people with merciful ferries, you may feel as if you are far away from the noise of the world and go into the pure land. The most striking thing in the center of the Thousand Buddha Hall is the sacred pagoda that sacrifices the parietal bone relics of the Buddha. The tower is 21.8 meters high, and its shape is based on the shape of the gilded Shippo Asoca Tower in Porcelain Tower of Nanjing. It is like the inverted central pillar of Sumeru in the Mo Kao Grotto at Dunhuang, symbolizing the world of clean and solemn World of the Lotus Sanctuary.